Educating girls is often not seen as a priority in Karamoja, one of poorest and least developed regions in Uganda. In one district, only 6.4% of girls finish primary school at all. 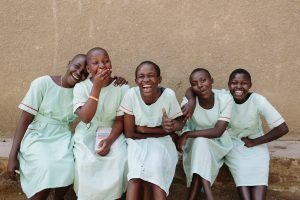 VSO Ireland has launched a new development programme to help more Ugandan girls go to school and address societal norms preventing them from getting the education they deserve. This project will be implemented by skilled Irish and Ugandan volunteers, and is being funded by Irish Aid, the Government’s official overseas aid programme which works on behalf of Irish people to address poverty and inequality around the world. VSO Ireland has already delivered a successful inclusive education programme in Karamoja, which increased literacy rates by 20% and numeracy outcomes by 10%. As this programme progressed, the need to have a greater focus on girls’ education emerged. Girls are not granted the same opportunities as boys for a number of reasons, primarily because they can bring their families more money through work or their “bride price”. VSO Ireland’s new programme will take into account the reasons why girls drop out of school or do not attend school in the first place, such as child marriage. VSO volunteers will work with local teachers and community groups to build their capacity, improve health and hygiene practices in schools, and remove stigma around girls finishing primary education. Lisa Barrins, a teacher from St Aidan’s National School, Co. Sligo, and Breda Dunleavy, who works in St Patrick’s Loreto Primary School, Co. Wicklow, both departed for Karamoja this week to commence their VSO placements. Over the next year, they will work with the District Education Officers in Kotido and Moroto, mentoring school leaders on inclusive education practices and helping them to develop education strategies that address the challenges affecting girls’ education. They will also collaborate with local community groups to reduce negative attitudes towards educating marginalised groups, not just girls but also children with disabilities and orphans. Lisa, who has already volunteered on education projects in Ghana, South Africa, Rwanda and Uganda, looks forward to embracing the new challenges this volunteer placement will bring. She said, “I’m delighted to be involved in this Irish Aid project where I’ll be working and living amongst the local Karamojong people in Moroto.” Breda is similarly excited to put her wealth of education experience to the test. “I am looking forward to meeting the teachers in the local schools and sharing ideas and experiences together to further the educational experience of all the children in the Karamoja region,” she commented.